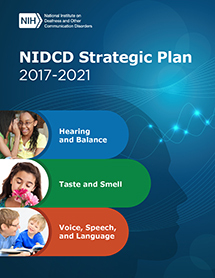 The NIDCD supports and conducts research and research training in the areas of hearing, balance, taste, smell, voice, speech, and language. The Strategic Plan serves as a guide to the NIDCD in prioritizing its research investment, illustrates the current state-of-the-science, and highlights recent advances in the communication sciences. The Plan presents a series of goals and objectives that represent the most promising research needs within the NIDCD’s mission areas. The 2017–2021 Strategic Plan is designed to help the NIDCD prioritize its research funding by identifying areas of outstanding promise, as well as identifying knowledge gaps. By funding research in these areas, NIDCD aims to improve the quality of life for people with communication disorders. The Director, NIH, has requested that each Institute and Center at NIH develop a Strategic Plan for Reducing Health Disparities. Human communication disorders cross all social and ethnic groups.